Looking for inexpensive entertainment for kids? A bag of balloons from the dollar store can provide hours of easy fun! Here are ten ideas for making the most out of that small piece of latex or rubber. Play balloon volleyball. If you don’t have a net, just lay a jump rope along the ground or line up lawn chairs as a center barrier. Run balloon relay races. Each person can simply run while holding the balloon or, to make it more interesting, try to hop with it between their legs. Once everyone has had a turn, allow the last person racing to pop the balloon. Take turns with your child(ren) rubbing a balloon over your hair so that it stands on end. Research together what causes that reaction. Draw faces on several different balloons with a permanent marker and have a balloon puppet show. 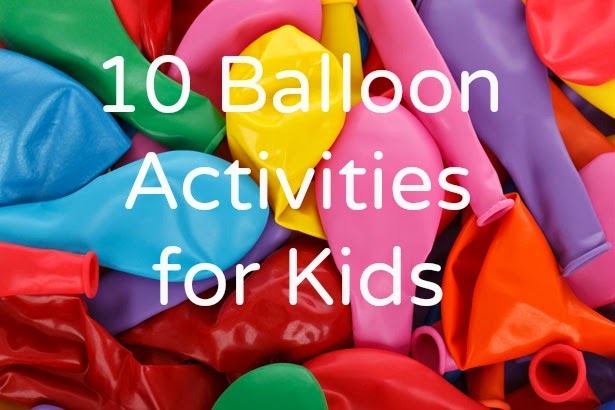 Use a balloon in place of a ball for a kickball or baseball game. For older children who can safely handle sharper objects, make a dart board by attaching inflated balloons to a piece of wood then throwing darts to see who can pop the most balloons. Find an online tutorial or a book at the library and learn to make balloon animals. Set up an obstacle course. Have each person go through the obstacle course while hitting a balloon with a broom. Use a stopwatch to see who can get through the course in the shortest amount of time. Put some beads in several different balloons. Either individually or in teams, have children pop the balloons and see who collects the most beads. What other ideas do you have for playing with balloons? We also used to play balloon volleyball over the couch! Great idea for an inside game; would help burn off some energy on these hot summer days! My kids have enjoyed quite a few water balloon fights this summer. Hmmmm, they never seem to be able to find all the scraps they leave behind! I have a love hate relationship with balloons at my house! My kids adore them, but they make them crazy and hence the hate part of the relationship! Thanks for making me think about letting them just be kids! So glad you stopped by 29lincolnavenue today! I hope you have blessed day! Balloon are so much fun but I really hate it when they pop. It always makes me jump, lol!